This corroborates the footnote of a recent American Press Institute study which found that only 43 percent of Americans thought it was easy to distinguish opinion from news on digital news sites and social media. The API researchers found that 52 percent of adults under age 30 said it’s at least somewhat easy to tell them apart on social media, versus 34 percent of adults 60 and older: “The level of ease was about the same for younger adults across all media types.” The study also noted that the young folk were understandably less familiar with print jargon like “op-ed” than the older adults. A different recent Pew study found that while 57 percent of American social media users expected the news they encountered there to be “largely inaccurate,” younger social media news consumers were — unsurprisingly — more likely to say social media has “impacted their learning for the better” (48 percent of those age 18 to 29, compared to 28 percent of those age 50 to 64). Op-eds have been playing a much larger role in the news cycle these days, with Trump’s anonymous underling writing in The New York Timesand the president’s error-ridden contribution to USA Today. 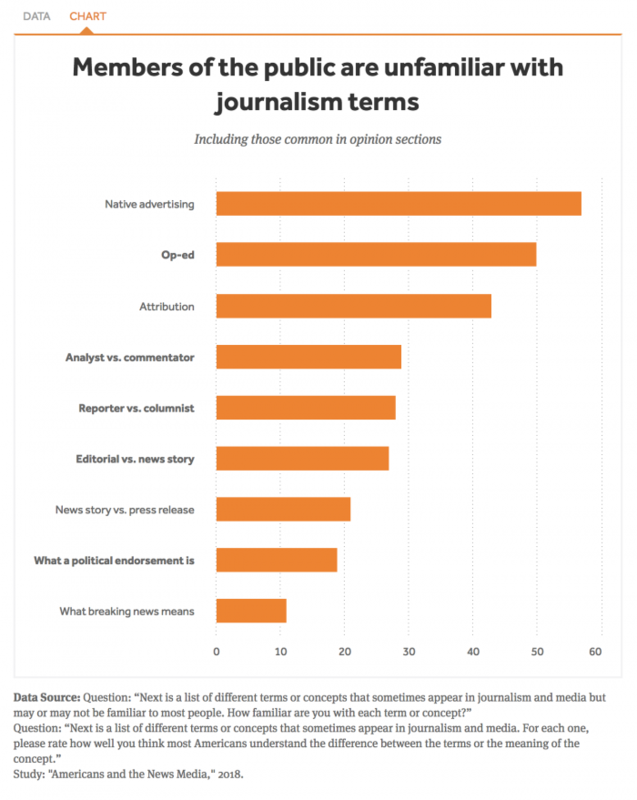 Instead of fighting with terms that are quickly becoming arcane, there are a few options beyond cheering the fact that rising generations of news consumers understand the newspaper layout. Main image CC-licensed by Unsplash via NeONBRAND. Other images courtesy of the Pew Research Center and American Press Institute.